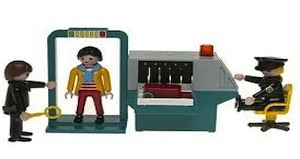 Unless you have been living under a rock the last few weeks, you know that the TSA has been in the news for their new screening techniques at U.S. airports. Stories about the new, practically pornographic x-ray screening machines, to those of passengers being groped when refusing the x-ray have been all over the news. All this is because bad guys try to bring things on airplanes that could potentially harm many people. baseball bat from many old time Yankees including Mickey Mantle, Roger Maris, Billy Martin, Yogi Berra and many more. The problem is this bat is still located at my parents house on the east coast. With a piece of memorabilia of such value I would never trust a commercial shipper, so the only option is to personally transport it from east to west. But how am I to know, with all the rules, if I can actually bring my baseball bat on the airplane? Have no fear, the TSA has released an iPhone app called “My TSA” (free in the app store) which lets travelers check security wait times at airports and get a rundown of ways to make the check-in process smoother. One of the most useful aspects is the “Can I Bring?” feature which lets users type in a name of an item to see if they are permitted to carry it on their flight, check it with their baggage or if the item is totally prohibited. To my dismay I will not be allowed to carry on my baseball bat, but can entrust my prized possession to the baggage handlers. NOT!!! After figuring out that my bat would not be allowed we decided to check on other things: golf balls, Christmas lights, and pillows are ok. Surprisingly knitting needles are also allowed, on the other hand, scissors, razor blades, and machetes are not allowed, but feel free to check your nunchucks. Finally the app gives you some smart traveling tips such as acceptable forms of IDs to how to dress smart thus eliminating the hassles of travel. After messing around with this app for the better part of a week I can’t believe the TSA took this long to put out an app advising passengers of wait times, airport status and what is and is not allowed on board. 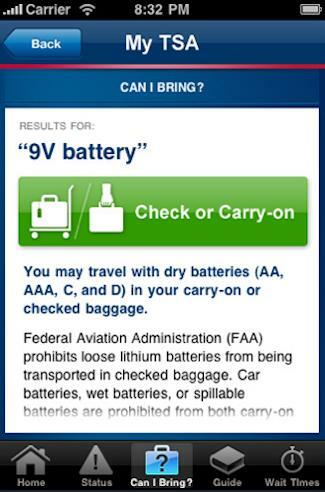 Do you think a wide adoption of this application will alleviate some of the air travel hassles? What other features would you implement in the application?